TurboFP650 (scientific name eqFP650) is a red-shifted variant of TurboFP635 (Katushka) [Shcherbo et al., 2010]. TurboFP650 is characterized by a strong bathochromic shift, with excitation and emission peaks at 592 nm and 650 nm, respectively. It is currently the brightest fluorescent protein with emission maxima above 635 nm. TurboFP650 demonstrates fast maturation at 37°C and a high pH-stability and photostability. The protein does not show residual short wavelength fluorescence of intermediate or alternative chromophore forms, in contrast to E2-Crimson [Strack et al., 2009], which exhibits a second bright blue emission peak, and mNeptune [Lin et al., 2009], which has a pronounced green peak. TurboFP650 is specially recommended for whole body imaging and multicolor applications. 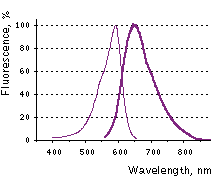 TurboFP650 normalized excitation (thin line) and emission (thick line) spectra. 700 nm and 900 nm, divided by 1000. TurboFP650 can be recognized using Anti-tRFP antibody (Cat.# AB233-AB234) available from Evrogen. Therefore, many common filter sets used for visualization of red and far-red fluorescent proteins, Texas Red, Allophycocyanin and Cy5 (wide excitation), can be used with TurboFP650 as well. TurboFP650 can be easily visualized within living tissues. Mammalian cells transiently transfected with TurboFP650 expression vectors give bright fluorescent signals in 14 hrs after transfection. No cytotoxic effects or visible protein aggregation are observed. Superior performance of TurboFP650 in whole-body imaging was demonstrated using mouse xenograft model. HEK 293T cells transiently transfected with a plasmids encoding either TurboFP635, TurboFP650, NirFP, mNeptune or E2-Crimson were injected intramuscularly into the gluteal region of mice. The cells were co-transfected with firefly luciferase plasmid to normalize the transfection efficiency and total numbers of injected cells. Imaging of cell implants and quantification at various emission wavelengths showed higher fluorescence from TurboFP650 at two excitation wavelengths. Despite its dimeric structure, TurboFP650 can be used in some fusions. However, for protein labeling applications we recommend using specially optimized monomeric TagFPs. TurboFP650 can be used in multicolor labeling applications with blue, cyan, green, yellow, and red (orange) fluorescent dyes. 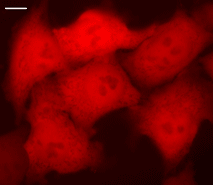 HeLa cells transiently transfected with pTurboFP650-N vector. Widefield Leica AFLX 6000 microscope, 63x objective, after 3 days of incubation. Scale bar, 10 μm. Image from Shcherbo et al., 2010.